MAC Trailer (Alliance, OH) has become recognized as the nation’s foremost leader in the manufacturing of tipper and moving floor transfer trailers. Simply, MAC knows the transfer industry and knows the importance of constructing a trailer that will withstand the most demanding of conditions, rigors and abrasive operations associated with the loading and unloading of mass volume and heavy bulk materials from waste, to wood, to agricultural, to recyclables, to scrap. That is why fleets, operators and transport companies turn to MAC, they know that they can rely on the structural integrity, durability and dependability that is designed, engineered and built into the top rails, the rear gates, hinges, bumpers and rear pockets of all MAC trailers. Introducing the new MAC Lite Moving Floor and MAC Lite Tipper Trailer—improving the commodity trailer industry with the lightest weights and superior engineering. Fully engineered and riveted design, laser cut and laser drilled to exacting tolerances with all aluminum and galvanized steel construction that reduces maintenance and upkeep. The all-aluminum cross members provide lighter weight, increased flexibility and superior performance resistance. 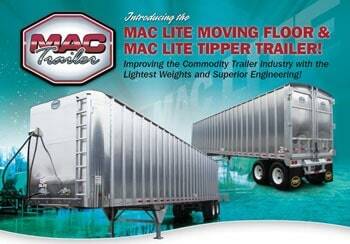 They have the lightest weights in the industry with a proven MAC Trailer design. Lengths range from 42 to 53 feet. For more information, call (800) 795-8454 or visit www.mactrailer.com.